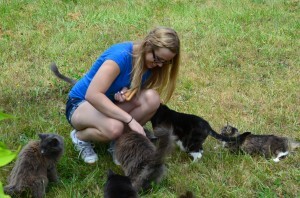 Volunteering at the Chapple Hill Cat Sanctuary can be a fun and rewarding experience. We are working to socialize cats that are not always happy to be near humans. 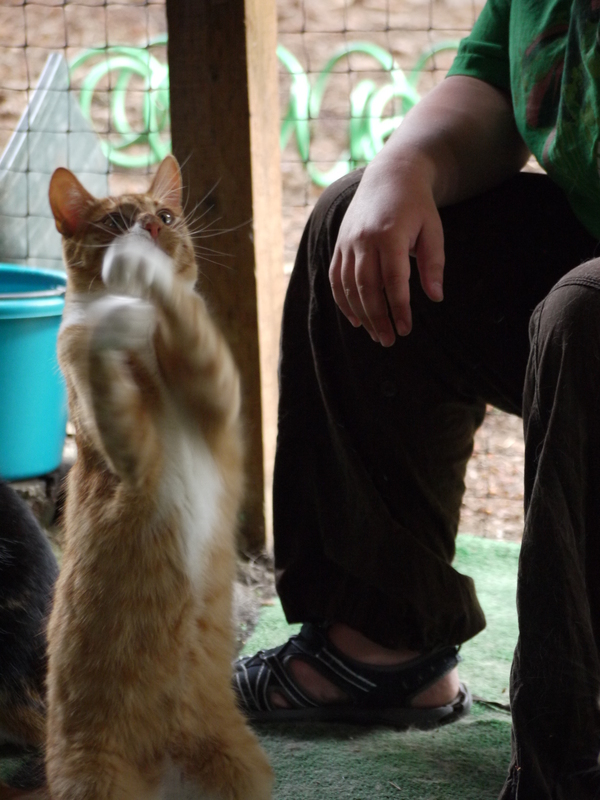 We have had quite a few success stories with previously feral cats becoming domesticated and happy to be near humans. There is nothing like the feeling of holding and petting a cat who previously wanted nothing to do with humans. To start your adventure, please fill out and submit a Volunteer Application. Regular chores need to be done everyday. We are in particular need of regular volunteers for weekday mornings to tend to regular chores such as scooping cat boxes, cleaning the kennel areas & house, feeding & watering the cats, etc. Special projects include gardening/yard work on the sanctuary grounds, rebuilding & remodeling kennels, irrigation to the kennels and other ideas. We welcome all ages to assist at the sanctuary, however, we do insist that children be able to control themselves around the cats as not all are friendly. In addition, children chasing cats who do not desire attention can be very distressing to our residents. Under adult supervision, younger volunteers are encouraged to play with cats who are interested in our toy selections. We will also offer training for grooming both long-hair and short-hair cats. Regular grooming helps to keep claws slightly duller and hairballs under control.